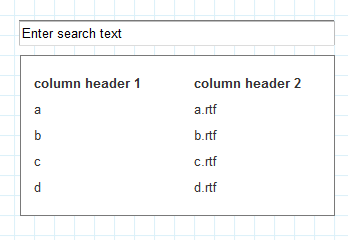 question - this is a table, and the user is trying to search for keywords under the column 2. However, the column 2 has a list of .rtf files. Can they search for a keyword inside the .rtf? Any advice/references would be appreciated. Thanks in advance. You can consider how Google Chrome behaves, when search term is within collapsed item. User is searching for "password", and Chrome displays a tooltip for the Sync collapsed section, where the search term is. So, just provide some visual indicator to achieve your goal. Not the answer you're looking for? Browse other questions tagged tables search files or ask your own question. Filtering through a large table of data, thoughts? Should searching by default be AND or OR? A User-Friendly Table - What Solution? Is there a pattern to inform the user to enter the full search string before hitting the search button?